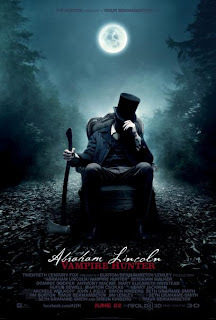 If nothing else, ABRAHAM LINCOLN: VAMPIRE HUNTER has a fun, clever premise: Seeking vengeance for the death of his mother at the fangs of a vampire, our future 16th President (Benjamin Walker) hunts down and kills the undead with a silver plated axe. And he's got his work cut out for him, because the American south is practically crawling with vamps who use the slave trade as an easy means of keeping themselves supplied with victims. Lincoln is aided in his efforts by the mysterious Henry Sturges (Dominic Cooper), who warns him not to have any close friendships or romantic entanglements, advice that's hard to follow once Lincoln lays eyes on the lovely Mary Todd (Mary Elizabeth Winstead). Watching this iconic historical figure pursue his vendetta from early, isolated strikes on lone bloodsuckers and then into his Presidency and a Civil War in which the Confederate troops are mostly bloodsuckers should be a hoot, but it's not. Director Timur Bekmambetov (WANTED) lacks either the courage or awareness to embrace the inherent absurdity of the material, nor does he elevate it enough to warrant the more or less serious, mainstream action film tone he opts for instead. If the film were better written that might work, but this feels like a Troma movie that had all the gags, not withstanding a few typically bland one liners, cut out. On top of that, the movie looks awful. The cinematography is muddy and drab, and the editing is a mix of incomprehensible fast cuts and gratuitous slow motion shots that still somehow manage to obscure what's happening. Walker makes a serviceable hero, but his opponents on the side of darkness, including Rufus Sewell as O.B. (Original Bloodsucker) Adam, are completely devoid of interest. Not that it's the fault of the actors, none of whom are given much actual acting to do. All the film requires of them is to hit their marks, say the bare minimum of words necessary to move the plot along, and then step aside for the stunt men and/or CGI to replace them in the action scenes that make up the bulk of the film's running time. Most bad films these days never sink below the level of mediocrity, so it's kind of a rarity to see something this bad get a major theatrical release. And yet, as bad as ABRAHAM LINCOLN: VAMPIRE HUNTER is, it doesn't even have the courtesy to be bad in an entertaining way. Again, the folks at Troma would have at least delivered on that level. 1 out of 4 stars.